KANDAHAR, Afghanistan -- Six American soldiers were killed in a suicide attack near the US-run Bagram Airfield in Afghanistan on Monday, NATO said. U.S. Army Brig. Gen William Shoffner, head of public affairs at NATO's Resolute Support base in the Afghan capital Kabul, confirmed the first three of the victims were American. The Taliban claimed responsibility for the suicide bombing, which was the largest attack on foreign troops in Afghanistan since August. Shoffner said it happened at around 1.30 p.m. local time in the vicinity of Bagram, the largest U.S. military facility in Afghanistan. NATO could not confirm the nationality of the dead, according to policy that requires identification to come from casualties' home countries. Earlier, an Afghan official put the number of NATO personnel dead at three, with another two wounded. 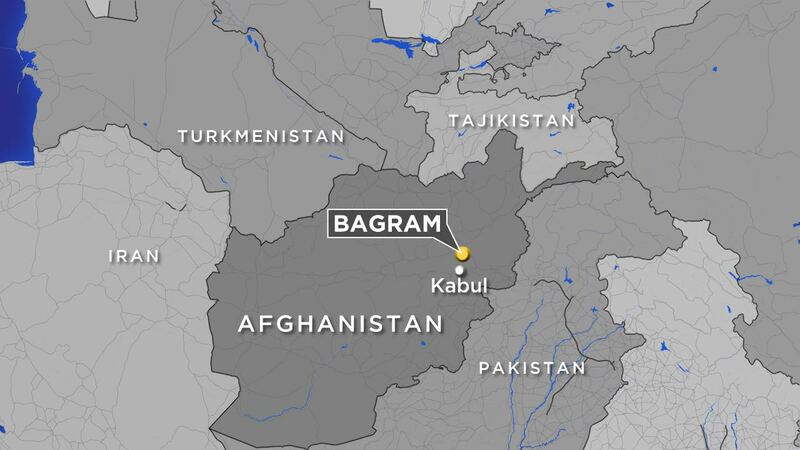 Mohammad Asim Asim, governor of Parwan province, where Bagram is located, said that a suicide bomber rammed an explosives-laden motorcycle into the combined NATO-Afghan foot patrol as it moved through a village close to the base, which is 45 kilometers (28 miles) north of Kabul. He also said that two Afghan police officers were wounded in the attack. It is the first major attack on a NATO military convoy since August 22, when three American contractors with the RS base were killed in a suicide attack on their convoy in Kabul. On August 7 and 8, Kabul was the scene of three insurgent attacks within 24 hours that left at least 35 people dead. One of the attacks, on a U.S. special operations forces base outside Kabul left one U.S soldier and eight Afghan civilian contractors dead. Monday's attack came as Taliban gunmen and government forces battled for control of a strategic district in the southern province of Helmand after it was overrun by Taliban insurgents, delivering a serious blow to government forces. Mohammad Jan Rasulyar, Helmand's deputy governor, said insurgents took control of Sangin district on Sunday. Only Afghan army facilities in the district had not been taken by the insurgents, he said. Casualties among Afghan security forces were high, he added, though he gave no figures. Afghan Army commandoes and special forces had arrived in Sangin to push a counter-offensive, the Defense Ministry spokesman, Dawlat Waziri, said. He told reporters the Afghan air force had conducted 160 combat and transport flights over Sangin in the past 48 hours. Among the insurgent forces in Helmand, "three out of 10 are foreign fighters," he said, adding that they included Pakistanis, Chechens, Uzbeks, Arabs and Chinese Uighurs. "The presence of the foreigners in this imposed war complicates the sitaution in Helmand," he said, echoing the government line that the war is run by a Taliban leadership believed to be based in Pakistan with official protection. Helmand is an important Taliban base as it produces most of the world's opium, a crop that helps fund the insurgency. Sangin district has bounced in and out of Taliban control for some years, and fighting there has produced high casualties among both Afghan and international forces. British forces in particular saw intensive fighting there at the height of the war in 2006 and 2007. Britain lost more than 450 troops during its combat mission in Afghanistan, more than 100 of them in Sangin. Helmand's deputy governor Rasulyar on Sunday took the unusual step of using his Facebook page to warn President Ashraf Ghani that the entire province of Helmand was in danger of falling to the insurgents if central authorities failed to send help. In Helmand, more than 90 members of the Afghan security forces died fighting in the two days before his Facebook plea, with hundreds killed in the past six months, he said in his open letter to Ghani. The head of Helmand's provincial council, Muhammad Kareem Atal, said that 28 members of the Afghan security forces - usually a reference to army and police who also fight on the front lines across the country - were killed fighting on Sunday. Another 15 were critically wounded, he said. "Around 65 percent of Helmand is now under Taliban control," Atal said. "In every district either we are stepping back or we are handing territory over to Taliban, but still, until now, no serious action has been taken," he said, echoing Rasulyar's plea to the central authorities for help. Important districts across Helmand province, including Nad Ali, Kajaki, Musa Qala, Naw Zad, Gereshk and Garmser, have all been threatened by Taliban takeover in recent months. Insurgents are also believed to be dug in on the outskirts of the provincial capital, Lashkar Gah. Taliban fighters, sometimes working with other insurgent groups like the Islamic Movement of Uzbekistan, have managed to overrun many districts across the country this year, as well as staging a three-day takeover of the major northern city of Kunduz. They rarely hold territory for more than a few hours or days, but the impact on the morale of Afghan forces is substantial. He said a major reason "that our forces are losing" was that many soldiers and police were deserting their posts in the face of the Taliban onslaught. "There is a big difference between the number of both soldiers and police recorded as on duty, and the real number," he said, saying the official record was stuffed with "ghost police and soldiers." The Taliban insurgency has spread across the country this year, following the withdrawal of international combat forces at the end of 2014. This has stretched government resources thin, as the traditional winter lull in fighting has so far failed to take place in the warmer, southern provinces. The war has intensified since the announcement in late July that the founder and leader of the Taliban, Mullah Mohammad Omar, had been dead for more than two years. His deputy, Mullah Akhtar Mansoor, succeeded him, causing internal ructions and delaying the likelihood that a peace dialogue with the Afghan government, halted after the announcement of Mullah Omar's death, will restart in the foreseeable future. The Pentagon released a report last week warning that the security situation in Afghanistan would deteriorate as a "resilient Taliban-led insurgency remains an enduring threat to U.S., coalition, and Afghan forces, as well as to the Afghan people."